The tabernacle was built in the year 1447 BC. Solomon's temple was built the year 967 BC and was destroyed by Babylon the year 586 BC. After it returned to rebuild by Nehemiah in the year 516 BC and was constantly improved until the year 24 DC by Herod. Again was destroyed in the year 70 DC and has remained without rebuilding from that year, but in a few years will be again rebuilt, so say the writings of the Tanack and writings Nazarenes. "Here I come (future) days, says YHVH, in which will make a new Covenant with the House of Israel and with the House of Judah." Not like the Covenant I made with their fathers the day I took her hand to get them out of the land of Egypt, as they invalidated my Covenant, even though I was a husband to them, says YHVH. But this is the Covenant that I will make with the House of Israel after those days, says YHVH: I will give my law (the Torah) in their minds and write it in their hearts (hasn't happened yet) , And I will be to them by God, and they shall be to me by people. And not teach (evangelism / discipleship) more every man his neighbour, and every man his brother, saying: know YHVH!, because everyone will know me, from the least of them to the greatest, says YHVH. For I will forgive their wickedness and will not remember me more than their sins". "In that day I will raise up the Tabernacle of David, already fallen, and will close their gaps and rebuilt-re its ruins (future), and I will build it as in the days of old;" So they possess the remnant of Edom and all nations which is called by my name, says YHVH, that does this. Here's days are coming, says YHVH, in which ara will reach the Reaper, and which stomps the grapes that carries the seed; The mountains destilarán grape juice, and all the hills will melt. And I will return from captivity to my people Israel (1948) and they reedificarán the devastated cities and inhabit them (like today), and they will plant vineyards and drink their wine, and make gardens and eat its fruit. Plant them in their land (Israel), and never (ever) will be more uprooted the land that I gave them. Oracle of YHVH, God yours". 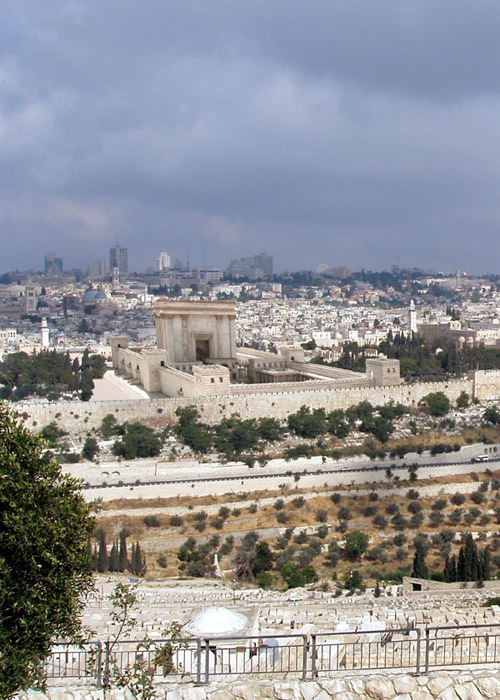 "And the children of Israel bring his offering in pure to the House of YHVH utensils (today the are putting together), thus all the Nations shall bring all your brethren (future), horses, carts and bunk bed, mules and dromedaries " to my holy mountain in Jerusalem (in the Temple Mount)as offering to YHVH, YHVH says, and among them I will choose priests and Levites (of new, although Yeshua is eternal priest, the great Preagreement), says YHVH. Because as well as the new heavens and the new Earth, which I will do remain before me, says YHVH; Thus your lineage (Israel) and your name (Jewish) will remain"." "And it will happen that novilunium novilunium, and shabbat shabbat (not Sunday), in which every creature will come to prostrate in front of me, says YHVH (future). "And they will come, and will look at the bodies of the men who rebelled against me: their worm shall not die, their fire shall terminate, and will be the horror of all mortals". "And I was given a cane similar to a stick, saying: rise and measure the Temple of God, the Altar, and they love that it (future, after the destruction of the Temple of Herod);" but the courtyard of the shrine leave it outside and do not measure it has been delivered to the gentiles, and they ho-llaran the Holy City for forty-two months (built after that there are no gentiles (Goy-no Jews) in the rock of the Temple) "." Isaiah 41:8-9 "But you, o Israel, my servant, Jacob, who I have chosen, the seed of Abraham, my friend." You whom I took from the ends of the Earth, and I called you end, to whom I said: you are my servant, tea, I chose and not you dismissed"." "And now Jacob, thus saith YHVH, he who created you, who formed you, o Israel: fear not, for I redeemed you;" you got a name, you are mine. When you pass through the waters, I will be with you, the current you not rise; When you walk through the fire, not tequemaras, the flame will burn you. Because me, YHVH your God, the Holy of Israel, I am your Savior. Egypt I have given for your rescue, Cus and Seba in Exchange for you. Because you are precious in my eyes, you were exalted, because I love you, I will give men for you, and Nations through your life. Fear not, for I am with you; From the East will bring your seed, and of the West you gather. I would say to the North: Da here! And to the South: don't hold back! "Bring my sons from far, and my daughters from the ends of the Earth"! 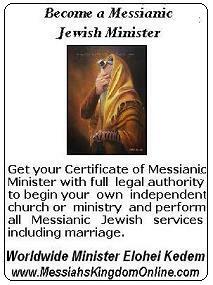 to the Messiah of Israel, Yeshua? In Hebrews 8:1-5 says: "now, the point main of what we have been saying is that we have such high priest who sat down at the right hand of the throne of the Majesty in heaven, Minister of Holy things and of the true Tabernacle that erected the Lord and n" or man. Because all high priest is constituted to present offerings and sacrifices; it is necessary that also this had something to offer. But if he were on Earth, he would not be priest in any way, even having those who continue offerings according to the law; which are figure and shadow of the heavenly things, as Moses was warned when he was ending the Tabernacle; then: look, he says, make all things according to the model that was shown you on the mountain. But now he has obtained a Ministry even higher, since it is also mediator of a better Covenant, which is based on better promises." Yeshua is priest Melchizedek "of the true Tabernacle that erected Adonai and not man" in heaven, not of the earthly Temple. May be the presence of Elohim in the earthly Temple (third Temple). "And they will make a sanctuary for me, and I will dwell in the midst of them. According to all that I show you, to the Tabernacle model and the model of all their utensils, so will do it"." Our churches and congregations should be like the Tabernacle and not what; something gave us the model. Yet in Deuteronomy 12:5 after 40 years of riding turns by Sinai, Moses was ordered to search the mountain of Elohim where the habitaria. "but the place that YHVH your God choose from all your tribes to put his name to his abode, there that you will seek, and beyond to go." Beyond shall bring your burnt offerings, your sacrifices, your tithes, the offering of your hand, your votes and your FREEWILL offerings, as well as parents of your cattle and your flock. There ye shall eat before YHVH your God and rejoice, ye and your households, for all that your hand, what with that YHVH your God has blessed you to acquire. You do not have to do according to all that we do here at today, each what seems to him, because so far you have not come to rest or the land that YHVH your God gives you. But When you've passed the Jordan, and manner in the land that YHVH your God made you to inherit, and he has given you rest from all your enemies around, and manner with security, then it will be to a place that YHVH your Dios single so it dwells in him his name Re, there shall all that I command you: your burnt offerings, your sacrifices, your tithes, the offering of your hand, and all chosen from your vows you've promised to YHVH"." "After YHVH will come out and fight against those Nations, as when he fights in the day of battle. That day (Future) your feet will rest on the Mount of olives, which faces Jerusalem on the East, and the Mount of olives will be split down the Middle, leaving a large Valley in the East to the West: half of the mount shall depart to the North, and the other half toward the South. And the Valley of Hinnon will be blocked, for the Valley between the two mountains will reach to Azal, and ye shall flee when the earthquake in times of Uzziah, King of Judah, and come YHVH my God with all his saints. And pass that on that day there will be clear, light or dark. It will be a day, which is known for YHVH, which will not be neither day nor night, but in the evening will continue having light. That day will happen also that Jerusalem will be living waters: half of them to the Eastern Sea and half to the Western sea, in summer and in winter. And YHVH shall be king over all the Earth. On that day YHVH will be one and his name one"." ' Son of man, now takes a stick and write on it: for Judah, and for the children of Israel, his companions. ' Then take another stick and write on it: to Joseph, stick of Ephraim, and for all the House of Israel, his companions. Put together them then each other as a single stick, so join in your hand. And when the children of your people you ask saying: do not tell us what you want to mean with that?, tell them: thus saith YHVH Adonay: Behold, I take the stick of Joseph, which is in the hand of Ephraim, and the tribes of Israel his companions , and I will put them together with the stick of Judah, and will make them a single stick, and they shall be one in mine hand. And the sticks on which you write will be in your hand before their eyes, and tell them: thus saith YHVH Adonay: Behold, I take the children of Israel from among the Nations where they were, I gather them from all over, and I will bring them to their own land (future explanation of the two clubs in the previous verses). And I will make them one nation in the land, in the mountains of Israel, and a King will be at all of them by King (Yeshua), and never again will be two Nations, nor ever again will be divided into two kingdoms (future), or pollute more to themselves with their idols with its abominations and all their rebellions. And I I will save them from all their rebellions which have sinned and I cleanse them, and I will be by people, and me to them by God. My servant David will be king over them, and all of them will have a single pastor(Yeshua) , they will walk in my precepts, and will keep my statutes, and will make them for work (The Torah). They dwell in the land which I gave to my servant Jacob, where your fathers dwelt (not the Palestinians.) In it dwell them, their children and the children's children forever, and my servant David will be Prince of them forever (forever ever). And will make a Covenant of peace with them. It will be a perpetual Covenant with them, and I will establish them and multiply them, and I will put my sanctuary (future: third Temple) among them forever. My tabernacle shall be in the midst of them (lighter impossible) " , and I will be to them by God, and they shall be to me by people". Shall be fulfilled the word of the creator of the universe, YHWH, our Elohim, Elohim of Israel, Elohim of Abraham, Elohim of Isaac and Jacob's Elohim. Thousand blessings to all and peace in Jerusalem forever!